Charles Alexander Piercey was born on the 20th January, 1890 at 101 Palmerston St. Carlton, Victoria, an inner Melbourne suburb. His father Charles Piercey was a Gardener, and his mother was Margaret Staley. Charles was their second child. Times were difficult then in Victoria, work was hard to find, with many men leaving for interstate and overseas searching for employment. Nothing is known about Charles’s childhood. Sometime in his teenage years, like many of his peers he became involved in athletic pursuits, for him, it was cycling which was very popular in that period. He joined the Coburg Cycling Club and at 20 years of age came to prominence with a win in the now famous Melbourne to Warrnambool Road Race, a journey of 165 miles (265km.). Charles was off the 47 minute mark and took a minute over 10 hours to complete the journey. Later that year he was beaten by a wheel in the also now famous Austral Wheel Race which was that year held at the Melbourne Cricket Ground on a grass track. He continued to race in Victoria and other parts of Australia. He took part in two six day races in Melbourne in February 1912 and February/March 1913. This type of racing was popular in many parts of the world and usually featured international riders. 1914 was a life changing year for Charles, he was part of a team of Australian Cyclists to head off to Europe for the racing, with a view to riding in the Tour de France. The team rode in a few pre-Tour events however only Snowy Munro and Don Kirkham gained entry into the Tour de France. “Snowy” Munro’s desire to further the status of Australian cycling overseas led to the formation of Australia’s first team for the Tour de France in 1914. 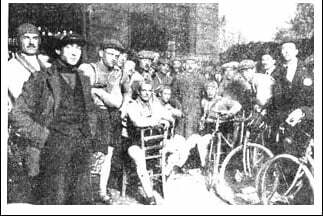 He captained that team, which included Don Kirkham, Charlie Snell, George Bell, and Charlie Piercey , the latter two being club mates at the Coburg Cycling Club, initially riding as professionals for the Paris-based Gladiator Cycles & Clement Tyre team, their first major Classic was Milan-San Remo where Munro finished 28th, finishing 10 minutes after the winner Agostini. 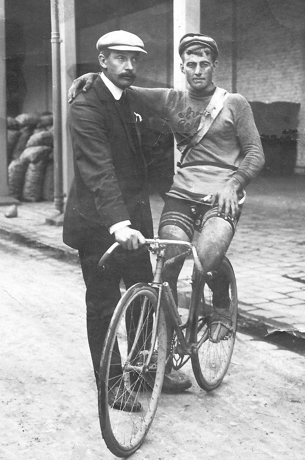 One week later in April, Munro and the team were hitting the pave in Paris-Roubaix, Piercey breaking a wheel, Kirkham breaking his bike and “Snowy” finishing in 37th place, 7 minutes behind the 1914 winner, Crubelandt. 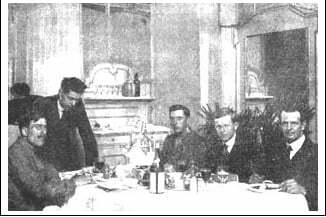 Barely two weeks later, their Tour de France preparation continued with a start in the two-week Tour of Belgium, followed by Paris-Bruxelles and Paris-Nancy. Of the Australians that left looking for Tour glory, only “Snowy” Munro and Don Kirkham gained selection for a Tour team (Phebus-Dunlop). The 1914 event the last to be held before 1919 consisted of 143 starters riding 5,380km over fifteen stages. Both riders putting up a very respectable showing with their best stage finishes being Perpignan-Marseilles where they finished 4th and 5th respectively. “Snowy” went on to cross the finish line of the last stage into Paris in 10th position. In the Overall Classification Munro finished 20th with Kirkham three places better in 17th – a very creditable and honourable attempt at the big event, reported the promoting newspaper L’Auto. Europe was a troubled place, France was invaded by Germany in early August, the next recorded news of Charles is on a Ship’s Passenger List of the S.S. St. Louis leaving Liverpool for New York, and the United States of America was to be his home for the last 52 years of his life. The first news of Charlie after his arrival in USA is in the cycling world, in November, 1914 he rode in a six day race at Madison Square Garden, New York and in December 1914 he is in New Jersey in another six-day race. They were big sports news in the States and results were printed by many papers, he rode in quite a few up to 1920. Charlie appears in the 1920 US Census as a Bolter Up in a Shipyard, his age has taken a backward step of 4 years and he has married a Minnie Kugel and living with his Mother-in-Law in Newark, New Jersey. The 1930 Census has him as an Auto Mechanic, living in Bloomfield, New Jersey with his wife, two daughters, Beverley and Gloria Piercey, also his Mother-in-Law is with them. Around 1930 Charles went into a Sport Fishing business, for he mentions in a 1959 letter that he’d like to sell up before the next season as he’d been doing it for 30 years and it was getting harder (by this time he’d be actually nearly 70 years old). He was well known and respected in the business and he had invested in 2 motels. 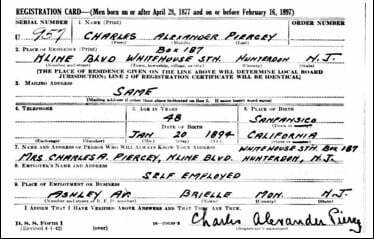 Charles registered as required by law for World War II, but was not called up. As you can see below he took a bit of “poetic license” with his age and birth place. Somewhere along the way Charles and Minnie had parted company and he’d married Marion “Monia” Rowley nee Padola. It’s known that he had 5 Grandchildren from his first marriage. Charles Alexander Piercey passed away on June 25, 1966 aged 76 years. Marion passed away on Feb.18, 2006, both are in Greenwood Cemetery, Brielle, New Jersey. His first wife, Minnie, passed away in 1973. I am one of the five grandchildren–Gloria had 3 sons–Halsey, Craig, and Forrest. Craig died 3 years ago, but Forrest (66) and I (62) are still alive. Gloria died at age 85 2 years ago. I remember him well, he was always in great shape and he used to take us fishing with his two dogs that went with him everywhere. I was too young to go hunting with him as we moved from New Jersey to Tulsa, OK but I always wanted to. Beverly had a son, Jeffrey (65), and a daughter, Brooke (61) who are still alive. Beverly died 5 years ago. I currently live in Nashville, TN. I was in Sydney and Brisbane 4 years ago and if I ever get back to Australia, I will try to look up some of the family. I am Brooke Baldwin Wisdom, Beverly Piercey’s daughter. It is so wonderful to read about my grandfather, Charles Piercey, and his family. 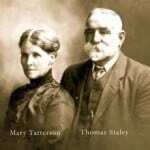 Unlike my cousin, Halsey (see above comment), I never got to meet my grandfather. Halsey has many scrapbooks and pictures of him and his bicycle racing career. He was quite the handsome fellow, and quite a sportsman. I’ve never been to Australia, but it is nice to know we have relatives there! I live in Gulf Shores, Alabama.